“I’ve been working in a really introspective way,” Jenny Lin said of her recent artistic endeavours. The visual artist and part-time Concordia professor has found herself in what seems to be a creative ebb—drawing back from her usual schedule to make room for new projects and pursuits. One glance at Lin’s resume will reveal how busy she’s been over the past couple of decades, with most of her artistic work taking place during her teaching career at Concordia. “I feel like I can be a better teacher when I’m actually making work,” she said. A 2018 recipient of the Fine Arts Distinguished Teaching Award, Lin is soft spoken yet firmly present. Lin began teaching at the university during her master’s degree in print media in 2001. She taught a screenprinting course in her third year, but upon graduating, found herself unsure about a career as a teacher. Instead, Lin worked in the studio arts office for a few years before Tony Patricio, the office administrator, convinced her to apply for a teaching position. She got her first teaching job in 2004 and has been an instructor at Concordia ever since. “It made me a bit more confident and sure that I wanted to do this,” Lin said about landing her first gig. What started as a few occasional classes developed into a steady schedule, and by 2007, Lin had solidified her place at the university. Lin’s screenprinted zine, avoid taking too personally or literally, 2018. Photo courtesy of the artist. It’s fair to say that she’s found the balance, because Lin’s artistic biography is staggering. Since her time as an undergraduate student at the University of Calgary, Lin has racked up over 150 credits in group and solo exhibitions, video screenings, residencies, artists’ book collections and workshops. But her list of accomplishments isn’t what Lin considers to be most important—it’s the people she’s been able to work with, and certain projects that have her particularly inspired. In her recent projects, Lin has been more focused on print media and zine work. These works can be immersive in their own way, she explained. In addition to being a tangible medium that the viewer can interact with, “artists’ books can fit in many spaces,” she said. Opposed to more traditional work that only appears in a gallery, for example, zines and artists’ books facilitate a more intimate relationship between work and viewer, Lin said. The artist said she feels more distant from the virtual world now than she did while creating video and digital work. “The way that I was presenting it, or the way that people were accessing it felt a little unsatisfying,” she explained. Lin refocused her practice, leading her to build quite an extensive collection of artists’ books, host bookmaking and zinemaking workshops, and participate in zine fairs across the country with her partner Eloisa Aquino, who is also an artist. Lin and Aquino publish some of their collaborative work under the name B&D Press. The artist’s 2016 poster/zine titled That which separates you and I or here and there. Photo courtesy of the artist. As for why she’s drawn to bookmaking and published work specifically, Lin said “[zinemaking] is a way to create a space for more marginalized voices, and also to create a different space where it’s about encountering different people.” She has worked with a variety of groups in efforts to showcase art from marginalized groups, such as the Qouleur collective, which focuses on art and activism of people of colour within the LGBTTQ+ community. 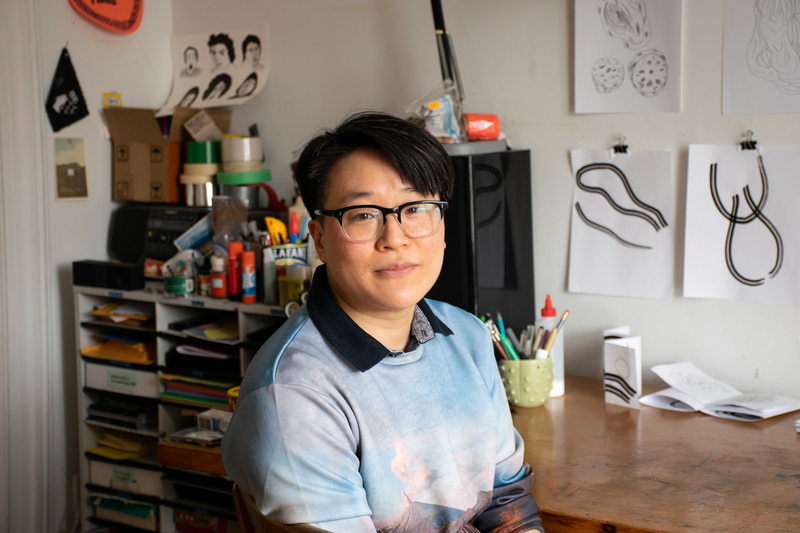 According to its Twitter page, Qouleur also hosts a “festival celebrating racialized queer/trans* identities and experience.” Lin said she connected with many people, and was inspired by the time she spent working with Qouleur. Although some may see print media and zine work as disposable, Lin believes in its ability to connect with and create space for those not reflected in the mainstream art scene. In mainstream publishing, for example, “there’s way more distance between the artist and the audience,” Lin said. She also finds smaller, physical artworks refreshing in an age of social media and technological inundation. “A physical object touches and impacts a person differently, and stays with them in a way that’s different than looking at something online and scrolling through or clicking through,” she said. “[Zine work] is a way to create a space for more marginalized voices, and also to create a different space where it’s about encountering different people,” said Lin. Photo by Gabe Chevalier. Lin’s home studio. Photo by Gabe Chevalier. Lin mentioned that her teaching schedule has reduced, allowing more time for creative pursuits, whatever those may be. She is currently working on a project with Aquino involving the Quebec Gay Archives. According to their website, “the Quebec Gay Archives have a mandate to acquire, conserve and preserve any handwritten, printed, visual or audio material which testify to the history of the LGBTQ+ communities of Quebec.” Lin and Aquino are interested in exploring queer people’s responses to their collections. Lin has also started an AR book in collaboration with Anteism, however it’s still in its early stages. “I feel like I’ve opened up more time purposefully,” the artist said, and although she has a few projects on the horizon, Lin is still waiting for them to take shape. “It’s just part of the process,” she said with a reassuring nod.